The Terracotta House, or… what is that? After an apocalyptic fire in 1886, the New York Architectural Terra-Cotta Works needed a new headquarters. One that befit its role as the preeminent manufacturer of architectural ceramics. Built in 1892 as an office for the company that supplied terra-cotta for Carnegie Hall and the Ansonia Hotel, among others. The company went out of business in the 1930s, and the building became vacant. It was eventually bought in 1965 by Citibank. 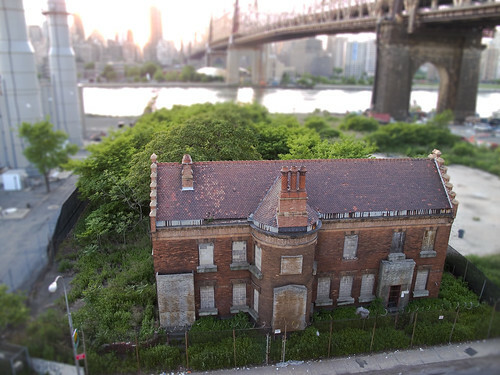 Its ruins can be found at 42-10 – 42-16 Vernon Avenue, across the street from the sumptuous hedonism of the newly opened Ravel Hotel, and next door to the venerable and recently feted span of the Queensboro Bridge. It was landmarked in 1982. Two and one half stories, the structure is actually the front office of an industrial complex that was once surrounded by a 12 foot high wall of brick, which enclosed an open storage yard, a 5 story factory, and the kilnworks one would expect to find at such a large endeavor. Its satisfying design was crafted by Francis H. Kimball, architect of the celebrated Montauk Club in Brooklyn, and it is in the Tudor Revival Style. In preparation of the forthcoming Silvercup west project, the City of New York is compelled to conduct archaeological surveys by state law, seeking any evidence of pre-contact native american artitfacts. The area is a likely choice for such artifacts, as 10th street (800 ft or so from here) is the site of a former stream that ran though an elevated section of the marshy land typical of western Queens on its course to the East River. Nothing aboriginal was found, but the presence of large scale 19th century industry would have likely obliterated anything that might have been there. 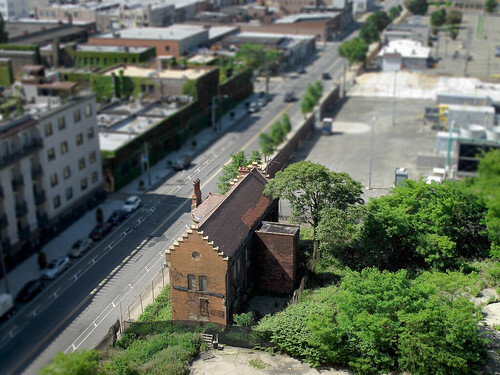 Notable forebears of the Terra-Cotta works in this area were the Wallach Mansion, and the Long Island Farms Orphans Schoolhouse – a city owned 4 building asylum which burned to ash in 1847. Ravenswood was a neighborhood of fine riverside estates by the 1860’s, and Willy Wallach wanted the site for one of his own. 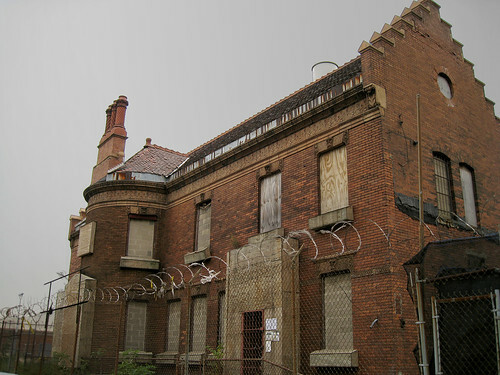 By the late 1880’s, after the 800 pound gorilla came to Long Island City, an ideal place for locating an industrial operation was in this neighborhood of former mansions. The New York Architectural Terra-Cotta Works company purchased the Wallach estate and the neighboring Gottlieb estate. After the Terra-Cotta Works ended its incorporation, no doubt due to the seismic collapse of the national economy in 1932, the facilities enjoyed a diverse career under its owner- RIchard Dalton. First- it continued manufacture of terra cotta ornaments for use in New York City Parks (when Robert Moses was in charge) as the Eastern Terra Cotta Company, second- in 1950 it began to serve as a sorting center for plastic waste and the bailing of waste paper, and finally- in something curiously named “electronics operations”. Dalton used the building for his personal offices until he died in 1965, and his heirs sold the property to Citibank. Spared demolition in 1976, Terra-Cotta House was orphaned when the rest of the site was obliterated by a wrecking crew. The building was landmarked in 1982, and is maintained by Citibank. The Silvercup West people plan on this being a charming feature for their development of the area. At the time of its glory, New York Architectural Terra-Cotta Works was the fourth largest employer in Long Island City. By the early 1970’s the place was abandoned and overgrown, forgotten by area residents. Local activists fought for and gained it landmark status in 1982. Be sure to check out this FEIS link, they’ve got a photo on the last page of the place in its heyday. Check out an old New York Times article on the Terracotta House here. Let consider this statement, “and is maintained by Citibank”. If the recent mortgage crisis has taught us anything it’s that banks don’t know how to maintain properties AT ALL. This place could be a beautiful bakery or upscale shops. To small for a big time banker to waste their time on. What a pitiful waste.